Diesel Bug Treatment is exactly what the product says. Our diesel bug treatment is a biocide blend formulated especially for preventing or eradicating the fuel spoilage organisms known collectively as diesel bug. A 100ml bottle is sufficient to prevent diesel bug growth in 2000 litres of fuel. For serious contamination addition rates of 100ml to 100 litres may be required. Very rarely over 15 years of selling the product have we had to clean out a tank but for severe contamination several doses may be required to break up and remove the biological sludge that forms. Our diesel bug treatment disperses into both the water and fuel phases in your tank and will remain sufficiently active for over a year at both high and low temperatures. Marine 16 Diesel Bug Treatment is the fuel treatment of choice for the RNLI, The Royal Marines, Sea Start and River Canal Rescue as well as being number 1 in the Practical Boat Owner magazine review. The growth of bacteria can be extremely rapid, as the organisms multiply exponentially. Good housekeeping and maintenance of your fuel storage system will help prevent the proliferation of bacteria and fungi and Marine 16 recommends the regular use of its’ Diesel Fuel Maintenance as preventative maintenance. 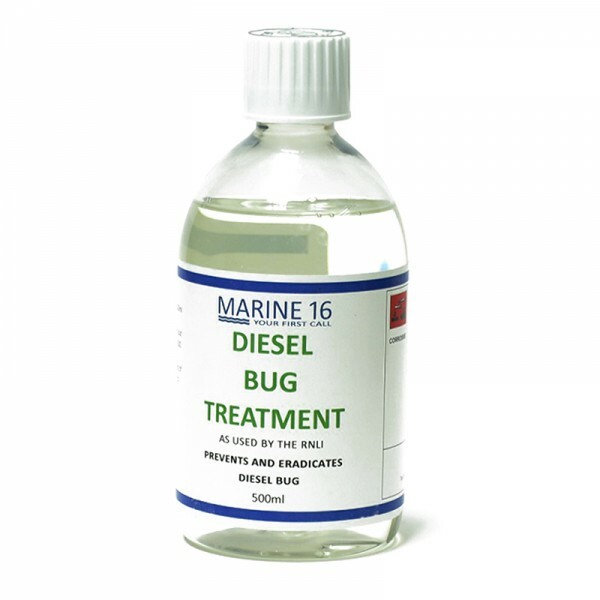 However if diesel bug is already present, Marine 16 Diesel Bug Treatment is specially formulated to eliminate bacteria, fungi and yeasts and inhibit their further growth within the fuel system or storage tank, at the same time dissolving slime residues and restoring clarity to the fuel. Just 100 ml of Diesel Bug Treatment will provide preventative treatment for up to 2000 litres of fuel. The product is added direct to fuel and effectively treats the entire fuel system, from tank to combustion chamber, forming a contamination suspension which is entirely removed from fuel tank, pumps and injectors in one operation via the combustion process. If contamination is already present, the treatment rate can be adjusted to suit – for example, if contamination is mild (evidenced by the presence of small, stringy slime elements) then one 100ml bottle per 500 litres of fuel will usually suffice. If contamination is severe and blockages have occurred, then a Shock Treatment rate of 100 ml to 100 litres should be used. Marine 16 Diesel Bug Treatment incorporates a highly effective diesel fuel preservative for the control and prevention of microbiological contamination in diesel fuel and is approved for use by Mercedes Benz AG, NATO, DAF and is used by Shell in the Netherlands to prevent/control microbiological contamination in fuels.